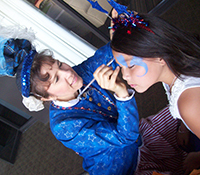 Make your party a little more fun with the addition of one of our talented face painters. These artists are not only skilled, but also highly energetic and personable. They are the perfect extra something to add life and playfulness to your event, party or special get together. 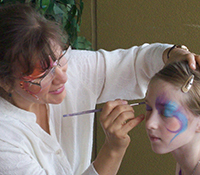 This versatile face painter has been a professional entertainer her entire life. 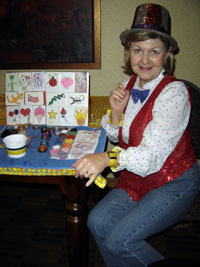 She’s delighted thousands of children and adults with her many wonderful characters and face painting talents. She is sure to bring out the child in all of your guests, no matter what your party or event might be. An event is truly interactive when your guests are part of the action. From Harley Davidson, to Renaissance, to Mardi Gras, and more; face painting, air brushing and henna tattooing are additions to any event. Your guests will enjoy the art and the fun.